That there is any other Dodger to write about besides the one who got his 44th hit in his 100th at-bat would be remarkable in any year, much less one that still features a last-place team in Los Angeles. But here we are on the final day of June with not only the remarkable Yasiel Puig to talk about, or even the sizzling Hanley Ramirez, but two others who are turning heads. You’ve met Stephen Fife – but have you met Stephen Fife? The 26-year-old, whose 2011 acquisition was derided in most quarters (including this one), not only threw seven shutout innings today, he lowered his June ERA to 2.21 – the best of anyone this month in the Dodger starting rotation. Yes, the rotation. I mean, do you realize that Fife is in the rotation now? He’s not some stopgap spot starter. He’s in. He’s taken a regular turn for six straight starts now, striking out 30 in 36 2/3 innings. It’s hardly too late for his chariot to turn into a pumpkin, that he’s John Ely in disguise, but 12 starts into his major-league career, he has a 2.78 ERA. In his own small way, far from the Puig spotlight, he has helped the Dodgers win eight games in their past nine and pull within four games of first place in the National League West, which has generated its own level of skepticism but for now remains the third-best division in baseball. Even at 38-43, the Dodgers are in a much more enviable position at the halfway point of their season than seemed fathomable just last weekend. The future looks brighter than any point since Opening Day. And again, that’s not just thanks to Puig. The Dodgers’ newest freshman, Jose Dominguez, exactly four months older than Puig, delivered the most electric debut this side of their precocious rightfielder. Hitting 101 on the radar gun, Dominguez relieved Fife in a perfect eighth inning, striking out his first major-league batter and displaying a tantalizing change to go with that fastball. Making it clear that he wasn’t equating Dominguez with Pedro Martinez, Vin Scully nevertheless said you couldn’t help thinking of the future Hall of Famer while watching the baby San Pedro de Macoris native. I can hardly wait to see him again, and I’m sure the Dodgers feel the same way. We’ll wait to see how Dominguez’ control plays out, but it’s easy to draw renewed bullpen hope in a potential lead trio of Dominguez, Paco Rodriguez and Kenley Jansen, with J.P Howell and Ronald Belisario in secondary roles. And that’s no small reason why there’s renewed hope in the Dodgers as well. The Dodgers just aren’t the same without Luis Cruz. Hours after the struggling infielder was, as expected, designated for assignment, the Dodgers were absolutely pounded by the Phillies. Los Angeles surrendered 12 runs on 15 hits in the first six innings tonight before scoring their first run, trailing 12-1 at press time. Now, you want me to believe that’s a coincidence? You must think me quite naive, sir. Philadelphia had 29 hits in their first 15 innings in Los Angeles. Part of the wonder surrounding Yasiel Puig is that what looked like a risky contract – seven years, $42 million for a mostly unscouted amateur – now looks like a bargain. But if Puig even keeps up a semblance of his current performance, that bargain isn’t going to last for long. After Puig earns three years of service time (at this rate, following the 2016 season, because the Dodgers called him up in June), he can opt out of his current deal and enter the arbitration process. And if you’ve paid any attention to Matt Kemp, Clayton Kershaw or even Chad Billingsley or Andre Ethier, you know what that means. Note: Puig was guaranteed $2 million in his first year, regardless of whether he played in the majors. Ethier was called up early enough in his rookie campaign to start his arbitration clock sooner. Although you’ll see Billingsley is currently slated to earn less than Puig over his first seven years, he still has a higher total during the arbitration-eligible seasons than Puig would have without opting out. Meanwhile, if he can post .850-ish OPSes like Ethier did in his arbitration years, Puig will probably add at least another $15 million to his bank account. Any Kemp-like MVP-caliber seasons from 2016 on will push Puig even higher. And if Puig continues to be otherworldly like a Kershaw – except one who plays every day – look out. Of course, whatever the extra dollars are, the Dodgers and their fans will gladly accept the consequences of Puig being a star, as long as he’s a star for them. The Phillies hit Zack Greinke and the Dodgers from pillar to post. The Dodgers took the pillar and the post and ignored everything in between, quite happily. Despite making 15 straight outs at one point, the Dodgers rode a big first inning and a two-out, 0-2 single by Yasiel Puig in the seventh to a 6-4 victory over the Phillies, giving Los Angeles their sixth straight victory. Puig, Adrian Gonzalez, Matt Kemp and Andre Ethier combined for five hits (of the Dodgers’ seven) – and made each one count. Los Angeles absoutely hammered Phillies starter (and Placentia-born) Jonathan Pettibone in the first inning. After a leadoff walk to Skip Schumaker, Puig scorched one off Pettibone’s foot, the ball taking a fluke bounce to shortstop Jimmy Rollins for a force out. But Gonzalez knocked a single, and Kemp and Ethier followed with hard doubles to put the Dodgers ahead, 3-0. 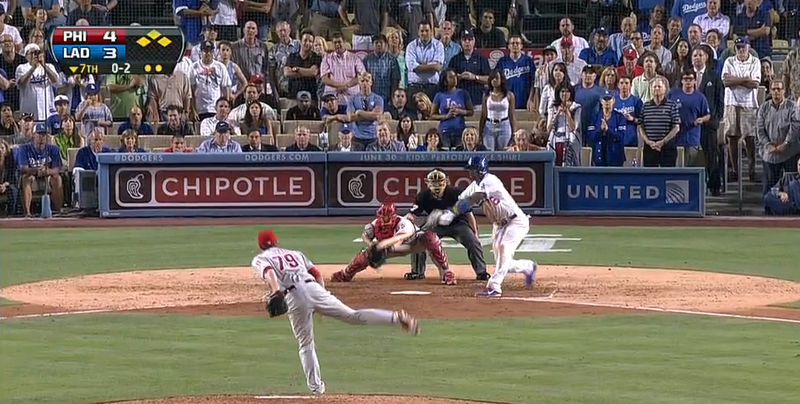 Pettibone might have been in jeopardy of completing the first inning had Puig’s ball gone through, or if A.J. Ellis’ long fly to right hadn’t been flagged down by Delmon Young’s running catch. From the second inning through the sixth, however, Pettibone retired his final 15 batters, allowing time for the Phillies to come back and take the lead. Greinke picked off one batter, saw another caught stealing and induced two double plays in seven innings, but that only partially mitigated the 12 hits he allowed, the last a two-out, tiebreaking home run by Chase Utley in the seventh. Puig smashed into the wall in a vain attempt to catch that drive, the latest scary moment for the Dodger daredevil. But he was not done shaking up the stadium. In the bottom of the seventh, relief pitcher Justin De Fratus walked Ellis on a 3-2 pitch. With two sacrifices in the past four seasons, Juan Uribe was asked to bunt. He not only put it down, but he reached first base after Ryan Howard fell down trying to field it. Pinch-hitter Hanley Ramirez was walked intentionally, and then Schumaker struck out. That set the stage for Puig. He swung and missed badly at two not-so-pretty pitches, and the next was so far off the plate, it looked like a fan heading for the exits. But Puig reached indelicately and somehow pulled the ball sharply through the hole into left field for a two-run single, rallying the Dodgers to a one-run lead. J.P. Howell and Ronald Belisario combined for a scoreless eighth, and the Dodgers manufactured an insurance run when, in his second full game back from the disabled list, Kemp and his hamstring singled, stole second and third, and scored on Ellis’ sacrifice fly. Kenley Jansen pitched a scoreless ninth, and despite tallying half the Phillies’ 14 hits, the Dodgers had another sweet victory. Notes on each member of tonight’s Dodger starting lineup. Skip Schumaker, 2B: Had a .440 OPS on May 7. Went 27 for 69 (.391) at the plate to raise OPS to .694 on June 9. Has gone 8 for 45 with four walks and no extra-base hits since. Yasiel Puig, RF: With 37 hits in 85 at-bats, only needs to go 3 for 15 to be at least at .400 after 100 at-bats. David Pinto of Baseball Musings notes that the most at-bats for an entire season for a .400 hitter since Ted Williams is 134 by Bob Hazle in 1957. Adrian Gonzalez, 1B: Three homers in six games vs. San Diego this month, zero homers in 18 games vs. everyone else. Matt Kemp, CF: Seven for seven in stolen bases this season. In his rookie season, he was perfect in six attempts. Played in 71 career games before his first caught stealing. Andre Ethier, LF: Making his first appearance in left field since 2008. A.J. Ellis, C: Has .260 on-base percentage, .284 slugging in 79 plate appearances since May 13. Juan Uribe, 3B: Per Fangraphs, has fourth-best WAR on Dodgers in 2013, behind Carl Crawford, Puig and A.J. Ellis. Nick Punto, SS: Riding a three-game hitting streak, but has .516 OPS in 130 plate appearances since May 8. Luis Cruz has a .525 OPS in 51 plate appearances in that time period. Zack Greinke, P: Opponents at Dodger Stadium have .270 OBP against him this year. Is the end nigh for Luis Cruz? We’ve had these kind of thoughts before. Heck, we had them with Juan Uribe all the time last year, and not only did it never come about, we’re actually glad Uribear has stuck around. But Scott Van Slyke is poised to be activated from the disabled list Friday, according to Austin Laymance of MLB.com, and – barring a new injury to the team, of course – there’s finally no one else to vacate a spot among the position players besides Cruz. The Dodgers could keep Van Slyke in the minors, but they seem committed, and most rightly so, to taking advantage of Van Slyke’s power bat off the bench. “With Scott, he allows us to go all right-handed (in the outfield) if we want to against a tough lefty,” Don Mattingly told Gurnick. Who else could go off the roster? Not regulars or veritable regulars A.J. Ellis, Adrian Gonzalez, Mark Ellis, Hanley Ramirez, Juan Uribe, Yasiel Puig, Andre Ethier or Matt Kemp. Not fellow reserves Tim Federowicz, Jerry Hairston Jr., Nick Punto or Skip Schumaker. Not anyone from the bullpen, which is at the now-conventional number of seven relievers, unless Brandon League somehow gets stuffed on the disabled list with sprained talent. No, the arrow is pointing directly at Cruz, who has a .175 on-base percentage and .164 slugging in 128 plate appearances this season, has five hits in the first 26 days of June and hasn’t played since June 19. And keep in mind the likelihood that after designating him for assignment, Cruz could easily clear waivers and end up back in Albuquerque, where everyone wants him. There’s still a couple days for things to change, but you’ve been warned. Or teased. The Giants “play as a unit, as a team, grinding out victories,” ESPN announced Dan Shulman said. I never get tired of Dodger victories. Even my favorite foods can get old through repetition – I can’t eat baby back ribs five nights in a row. But Dodger victories always go down smooth, and frequency only makes them sweeter. After tonight’s 4-2 victory over San Francisco, giving the Dodgers a series sweep and pulling them within six games of first place in the National League West, my appetite is only growing. In a taut ninth inning, Kenley Jansen retired the final three batters with the tying runs on base, saving Clayton Kershaw’s victory. Kershaw completed eight innings, striking out seven while allowing five baserunners, including a two-run homer by Buster Posey that put the Dodgers behind in the fourth inning, 2-1. The Dodgers rallied with three runs in the bottom of the sixth, threading a double with three singles and a wild pitch, and the victory was theirs for the taking. And they took it. Matt Kemp is not in the Dodger starting lineup tonight. According to Dylan Hernandez of the Times, the Dodgers scheduled a day off for him after his return to action Tuesday. Matt Kemp is in the Dodger starting lineup tonight, batting fifth. Yasiel Puig hit an effortless homer in the first inning. Hyun-Jin Ryu allowed 11 baserunners to his first 24 batters, and gave up but a run. Buster Posey fall down. Puig hit an effortless go-ahead single in the eighth. The bullpen faced eight batters without a hit or walk. The Dodgers won their third straight game for the first time in more than two months, ending a five-game losing streak to San Francisco with a 3-1 victory tonight. Funny when things are happy. Despite his unreal start, Puig was the cause of some concern heading into this game, having gone 1 for 7 with three strikeouts in the final two games in San Diego. But quietly, he drew two walks, showing signs of willingness or ability to lay off bad pitches. What would that mean tonight? In the first, Puig took a called strike, then a ball, then smoothly drove a Madison Bumgarner pitch on the corner down the right-field line and just inside the pole for a 1-0 Dodger lead. In the third, Puig fouled off a strike, swung and missed, then lined to center. In the sixth, it was ball, foul, miss and then a single to center. And in the eighth, facing the same George Kontos who gave up Clayton Kershaw’s eighth-inning, tiebreaking Opening Day home run, Puig took ball one, then lined a hard single to left field to drive home Nick Punto, who had led off the inning with a double. That meant for the game, Puig saw 12 pitches and had more hits (three) than missed swings (two). He now has a .476 on-base percentage and .753 slugging percentage. Ronald Belisario relieved and struck out Hunter Pence on a 3-2 pitch to end the inning, setting the stage for the Dodger bullpen to do what they needed to do – keep the Giants from scoring. On April 12, the Dodgers had a two-game winning streak and Clayton Kershaw on the mound in Arizona, but they lost. On April 24, the Dodgers had a two-game winning streak and a ninth-inning lead in New York, but they lost. On April 27, the Dodgers had a two-game winning streak and a seventh-inning lead against Milwaukee, but they lost. On May 13, the Dodgers had a two-game winning streak and A.J. Ellis tripled, but they got plastered. On May 17, the Dodgers had a two-game winning streak and a sixth-inning lead in Atlanta, but they lost. On May 29, the Dodgers had a two-game winning streak and two homers in the ninth inning against the Angels’ closer, but they lost. On June 5, the Dodgers had a two-game winning streak and Kershaw on the mound against San Diego, but they lost. 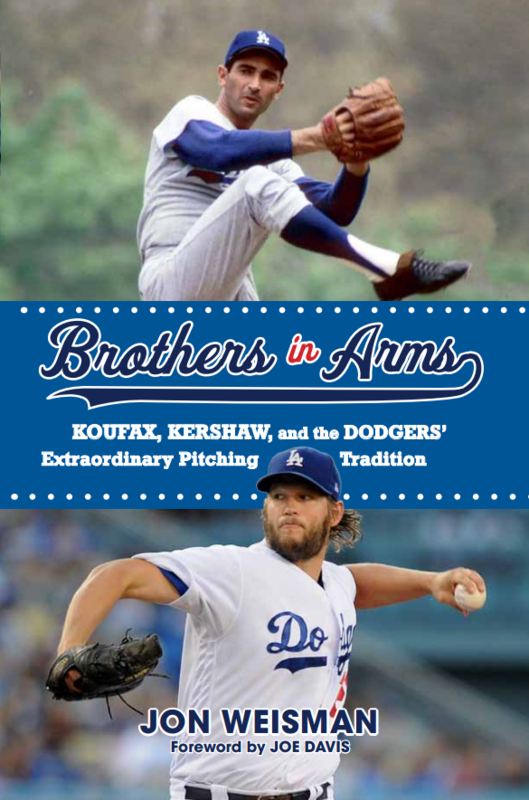 On June 8, the Dodgers had a two-game winning streak and … you get the idea. Eight straight times the Dodgers have failed to win three in a row. What happens tonight? Well shoot, who knew all it takes to be happy is strong starting pitching, capable relief, clutch power hitting, diving catches and all-around greatness from Juan Uribe? We should’ve asked Latka.